How Many Men Does It Take To Steal $1,354 Of Designer Jorts? Filed to: who steals short shorts?Filed to: who steals short shorts? Depending on who you ask, it could take any number of men to complete a simple task like screwing in a lightbulb. But when it comes to the more complicated feat of stealing $1,354 worth of designer jean shorts, the number of men required is apparently six. DNA Info is reporting that six fashionable thieves “shoplifted $1,354 worth of designer jean shorts from the True Religion boutique” on Monday. The men grabbed two pairs of shorts worth a total of $356 and four acid-washed shorts worth a total of $992, then fled the shop. It took six men to steal six pairs of shorts?! That’s one tiny pair of on-trend jean shorts pair per thief (unless someone doubled or tripled up). Maybe one guy took all six and the other five acted as lookouts? I don’t know how thievery works, let alone designer thievery, but this feels like overkill on the part of the criminals. 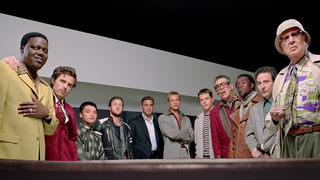 I mean, George Clooney only needed 11 guys to steal $150 million from Andy Garcia, and most of them were idiots. Imagine what he could have done with six of the smart ones in a single True Religion! I can see the reboot now.